For 175 years the British have lived with the railway, and for a long while it was a love affair - the grandeur of the Victorian heyday, the glorious age of steam, the romance of Brief Encounter. Then the love affair turned sour - strikes, bad food, delays, disasters...Parallel Lines tells the story of these two railways: the real railway and the railway of our dreams. Travelling all over Britain, Ian Marchant examines the history of the British railway and meets those who still hold the railways close to their hearts - the model railway enthusiasts, the train-spotters and bashers (a hybrid of train-spotting where the individual - usually male - has to travel behind a certain locomotive in order to catalogue it), the steam enthusiasts. 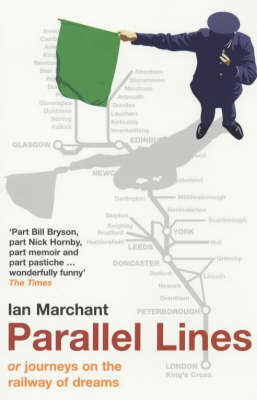 He swaps stories with commuters at the far reaches of London suburbia, he travels to deserted railway museums, and smokes cigarettes on remote, windswept stations in the furthest corners of Scotland, turning his characteristic eye for character, humour and surprise to one of the great shared experiences of the British nation. Why Do Shepherds Need a Bush?